The U.S. Weather Bureau describes the San Diego climate zone as the most nearly perfect in America. It can be characterized as Mediterranean-like, with mild winters and moderate summers. The typical San Diego weather forecast of "sunny and mild" is just one of the many reasons why we enjoy living here and why so many people love to visit. When tourists hear the beautiful San Diego weather news, they flock here from the midwest and east coast to escape the frigid winter cold and from the desert and southeast to get away from the blistering summer heat. The San Diego weather radar map and San Diego weather satellite image are useful tools to predict the San Diego weather forecast. More detailed reports on the weather in San Diego. Click here for the Accuweather 15-day San Diego weather forecast. Click here for the Wunderground report on weather conditions in San Diego. Click here for the Intellicast 10-day San Diego climate zone forecast. Click here for the MyForecast San Diego weather report. Weather forecast for other cities in San Diego County. San Diego County is huge, covering an area of 4,225 square miles. It stretches 65 miles from north to south and 86 miles from east to west. This size and the different terrain creates a wide variety in the San Diego local weather conditions - known as the San Diego microclimates. 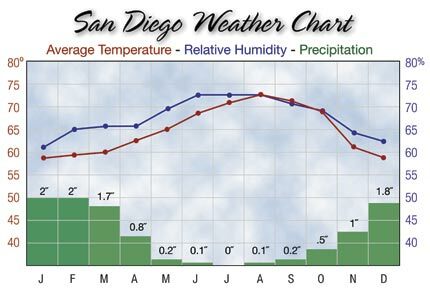 The official San Diego weather forecast, weather averages and climate statistics are for the San Diego International Airport, which is located on the coast. However, as you travel east into the canyons, mountains and deserts, San Diego's climate changes dramatically. The San Diego climate zones are very moderate with an average year-round high temperature of 71º F (21.7º C). The average year-round low temperature is 57º F (13.9º C). Summer daytime highs average a very pleasant 75º F (23.9º C) and the San Diego weather report in the winter is usually mild with the daytime temperature warming up to 65º F (18.3º C), on average. Here are average monthly temperature statistics that are typically found in the San Diego weather report and forecast. Statistic Jan Feb Mar Apr May Jun Jul Aug Sep Oct Nov Dec Ave. The yearly rainfall is light - averaging only 10.3 inches (26.2 cm) per year. Most of it falls from November to March. You can use the San Diego weather radar map and San Diego weather satellite image to track the rain and other precipitation. Rarely does the San Diego weather report include severe weather, as we experience few thunderstorms and virtually no hurricanes or tornadoes. The winds in San Diego are generally steady - picking up slightly in the springtime and tailing off a bit in the fall. Occasionally, a water spout can be observed off the coast. Here are more monthly statistics on the weather in San Diego. Precipitation (") 2.0 2.0 1.7 0.8 0.2 0.1 0.0 0.1 0.2 0.5 1.0 1.8 10.3/yr. Clear Days 12 10 11 10 8 9 13 15 15 14 15 14 146/yr. Partly Cloudy Days 7 8 9 10 11 12 13 12 10 10 8 8 117/yr. Cloudy Days 11 11 11 10 11 9 5 4 6 8 7 10 102/yr. What makes the San Diego climate so perfect? The prevailing breezes off the Pacific Ocean temper the weather report for San Diego and protect us from extreme weather reports. That's why the San Diego climate zone is so moderate, compared with other places along the same latitude. The winds here are typically light, out of the northwest, except during "Santa Ana" conditions. That's when the San Diego weather forecast includes high winds blowing from the east, bringing in dry, hot desert air that can push the temperature up into the 90ºs for a few days at a time. "Santa Ana's" can fly in anytime, but they usually occur in September and October and are strongest in the inland valley and mountain San Diego microclimates. Most weather storms miss San Diego! Most of our occasional winter storms come in from the north. And since the jet stream usually tracks north of San Diego, we rarely have the violent winter storms with heavy rainfall forecasts that flood Los Angeles and Orange county - just 100 miles to the north. For example: the severe winter storms of 2004-05 dropped a record-setting 35 inches of rain in Los Angeles, while San Diego received only 23 inches. You can make your own weather forecast by looking at the San Diego weather radar map and San Diego weather satellite image. Also, San Diego is uniquely located to avoid the summer monsoons that blow south of us across Mexico and Arizona. The San Diego weather forecast does occasionally include summer thunderstorms in the mountains. Several times each winter, a snow storm will blanket the Laguna Mountains, creating spectacular views and drawing delighted San Diego residents to play in the snow. Is this the best opportunity in your lifetime to buy a home? Click here to search San Diego real estate and homes for sale.